Timeshare rentals just when you need them, Last Minute!! Are you taking advantage of the hottest vacation deals available? If your vacation accommodations include the plan to rent a timeshare, then the answer is, yes! Savvy vacationers recognize that the decision to rent a timeshare opens the door to some of the most amazing and affordable opportunities in vacationing today. For less money than you would typically pay to rent a hotel room, you can rent a timeshare and vacation in spacious and luxurious timeshare villas, condos, or suites. You’ll enjoy the same benefit vacation owners are enjoying, without the commitment or responsibility of timeshare ownership. Who Benefits From Renting Timeshare? Vacationing families and couples who need more spaciousness than typically found in a single hotel room. Large or extended families who would need to book multiple hotel rooms if not for timeshare rentals where they gain more space for less money while enjoying the benefits of having everyone under one roof (but not in each other’s hair). Anyone considering buying a timeshare who wants to know more about the experience of timesharing or to check out a resort firsthand. Travelers who want spacious accommodations but don’t want to roll the dice by renting a private vacation home, where you never know what you are getting until it’s too late. Vacationers who want resort amenities, but prefer to dine in, utilizing the kitchen in their timeshare rental to save money or address their dietary preferences. Companies and groups who want to pay less for their travel accommodations, without sacrificing on amenities and comfort. 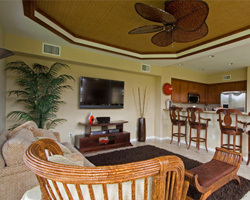 At BuyaTimeshare.com, we make renting timeshare a simple, straightforward process for both owners and renters. Maybe you don’t know where you want to go, but you know what you want to do, such as golfing or spending time in a casino. When this is the case, just click on the words “Advanced Search” at the right of the search bar, then click on the activity you are interested in enjoying such as “golf” or “casino” in the Activities section. In fact, you can filter your search by any or all of a number of categories, including location, resort, amenities, unit type, size, and the price you want to pay, by using the search filters in this section. Include as much as you know but don’t worry about how much you leave blank; it won’t hurt your search results. The only category you must include when you filter your results to rent a timeshare is the “Advertisement Type,” which means selecting that you want a timeshare “For Rent” to ensure that you only find rental opportunities in your results. Step 2: Shopping is always the fun part. Review the results of your filtered search and you’ll likely find many timeshare resorts from which to choose. Peruse these timeshares, reading more about those that interest you most. When you find the property you most want to visit, click on the name of the resort for more information, then click “Timeshares for Rent” (the blue button) and you’ll immediately see all the rental deals advertised by owners for the property you have selected. Step 3: When you are ready to place your offer, click on the yellow button that says “Make Offer”. You’ll be asked to provide only the following information: Your first and last name, phone number, email address, rental dates, offer amount, and whether or not you would like Broker Assistance to rent a timeshare. 1-2-3, it’s really that simple. The next step happens when the current owner responds to you, letting you know if your offer has been accepted and explaining to you how to finalize your timeshare rental transaction. After that, all that’s left for you to do is start packing! Timeshare Pulse: Your Next Great Vacation May Be Just a Heartbeat Away! We are checking the pulse on the timeshare rental market moment by moment, on the lookout for the vacation rental you want. The minute a deal that fits your objectives is added to our inventory, we’ll be emailing you the details. Timeshare Pulse simplifies your rental search and it works equally as well when you are looking for a timeshare to buy as when you are looking for a rental. Sutton Hall Timeshare Club Ltd.